For vaccinating multiple sheep, goats, swine and cattle with only 1 filling. Will use Luerlock or slip fit needles (not included). 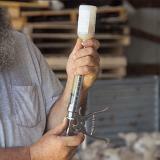 This syringe is easily put down leaving both hands free to refill the chute, mark an animal for special attention, etc. Adjusts to deliver 1 -5 ml at a time. Set the dosage using the turn dial at the rear of the barrel. Can be set in 1 ml increments from 1 to 5 ml/cc. Set the knurled tension nut that is at the end of the plunger. Turning it clockwise tightens the rubber washer inside the glass barrel making it more sealed, but also more difficult to move for filling and when giving treatments. Turning counterclockwise results in the opposite effects. After attaching a needle, fill the syringe by inserting the needle into the bottle of medication (make sure any protective metal cover on the bottle has been removed first) and turning the bottle and syringe upside down. In this position retract/pull the plunger down. 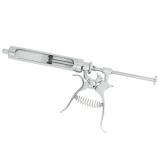 This will "draw" medication into the barrel of the syringe. While filling you may need to push air from the barrel back into the bottle and retract again to fill up the entire syringe. 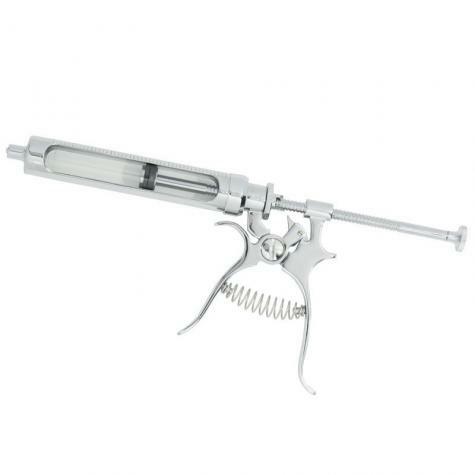 Syringe has a glass barrel, so you must be careful to not drop or bang it against anything solid. For livestock use only. If it is not filling correctly or liquid is seeping around rubber gasket, turn the knob at the end of the syringe bar. This will tighten or spread the rubber gasket inside the barrel to make a better seal. Replacement parts only for Premier's Pistol Grip Auto-Syringe. For the first season (probably 150-200 vaccinations) this worked perfectly. Now the rachet slips, doesn't deliver the dose and jams the the recoil. Can't seem to readjust with the set screws. Frustrated! I like the syringe. It is easy for folks like myself who are new to this sheep business to figure out and use. A word of caution and kudos to Premier: the glass barrel is very fragile so be careful cleaning it. I broke mine and had to put off getting vaccinations done because I had not ordered a spare barrel. ORDER the spare barrel! Kudos to Premier for their easy exchange process when one of my barrels showed up broken. I simply called and explained that it was broken in the box and they sent another one right out. Thanks guys!